Dimensions: 11-1/2 x 15-1/2 x 1-1/4 in. Box with hinged lid, 5 animals on 9 punch-out cards, full-color illustrations, ages 3 and up. 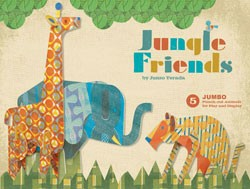 Featuring the unique designs and vibrant patterns of Japanese artist Junzo Terada, this collection includes five different jungle animals—a crocodile, elephant, giraffe, lion, and tiger! These adorable animals are a beguiling addition to any room—nursery, classroom, or office. To assemble, simply punch out the pieces and fit the matching slotstogether. No scissors or glue needed.